One of the top professional forex trading always using basic technical analysis forex trading with candlestick patterns. This standard analyzing usually using daily and four hour time frame. 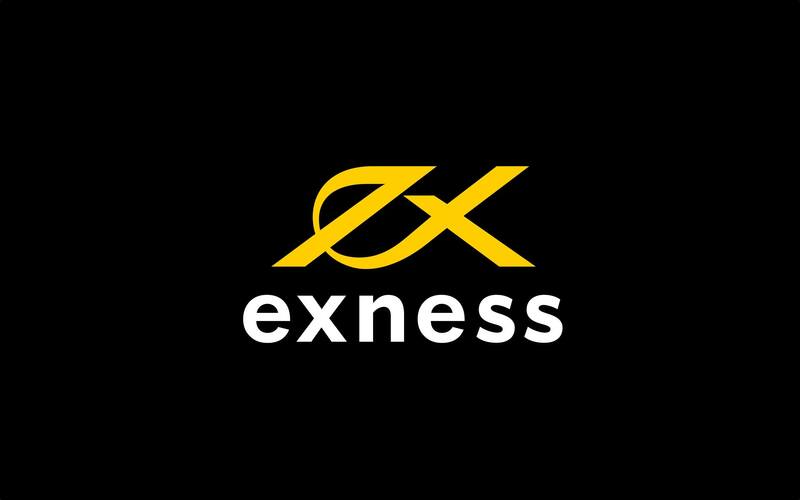 So we can trading with flexible time and no need stay in in front of your laptop or your pc all day long or all night long. Don’t waste your time because forex!! is it right? I think your answer the same with me. We should learn and practice using daily and four hour price action trading strategy beside this forex basic learning e-book. Supply demand trading strategy is one of my favorite trading strategies, is because in simplicity. 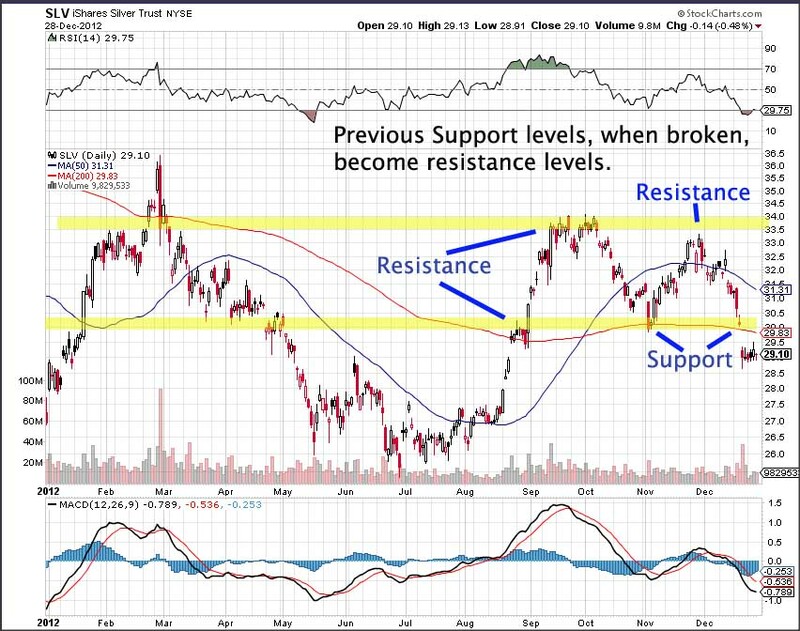 Well in my opinion the best demand and supply levels are those that don’t have been tested at least once so far. Untested demand / supply levels should always offer us a opportunity to trade cheap since there should be a lot of orders left. 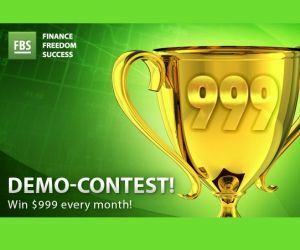 Today i will share the complete collection of lock profit expert advisor. As a manual trader, sometime we need easy tools to take handle our trading activity as well. 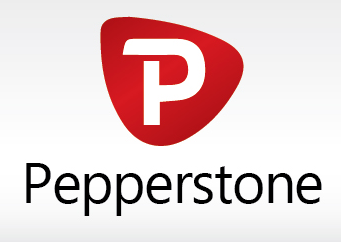 I mean this one of great forex tool is profit lock expert advisor. Activity trading with locking the profit pips is always a challenge for any manual trader, sometime in a day the price was swinging to the right way, but in the end of the day the price booked a loss. Riding the trend is very hard doing it manually, not to mention the time required to do it, while you probably at work or in the road. 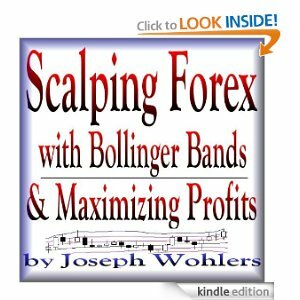 Tonight i will share my tested scalping strategies with bollinger bands and four zig zag. One of the best pair on using this scalping strategies in eurusd,usdjpy,eurjpy. This is my three favorite pairs. But before we take action to trade with this accurate scalping strategy, money management still have to be applied on each entry lot and combined it with averaging 15-30pips per step. We look for these bearish patterns in a down-trend within the context of continuation pattern. Don’t forget, this is not a reversal pattern but a continuation one. These patterns consist of two candles. We look for Bullish Three Line Strike candlestick pattern in an up-trend within the context of continuation pattern. Don’t forget, this is not a reversal pattern but a continuation one. The pattern consist of four candles. As a continuation of the established up-trend, first we see three bull candles resembling bullish three white soldiers or simply 3 up. Each bull candle should close higher than previous candle. The last candle of the pattern is a long bear one. It closes around or below the first candle open. Today’s article is about raising and falling three methods from continuation candlestick pattern. This continuation candlestick pattern is very important on reading psychology of market cycle that we can apply in our trading rules. We look to see these patterns on a down-trend. Last candle of the downtrend is a large bear candle. Of course we don’t know at this point if it’s a last candle of down-trend. We can re-phrase it by saying the first candle of the three inside up candlestick pattern is a large bear candle on a down-trend. We have another couple of reversal candlestick patterns with an interesting names. 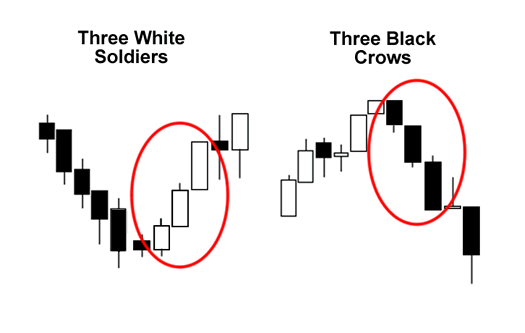 While the bullish version of the same pattern named as a white soldiers, the opposite of version called not 3 black soldiers but 3 Black Crows. I guess they tried to avoid any possible tone of racism. Well, if I was naming them I’d have used for bullish version 3 Brave Soldiers and bearish version 3 Rebel Soldiers if were to stick on with soldiers theme. Perhaps more simpler approach would have been better by just naming them 3 Up Pattern and 3 Down Pattern. Lets start with engulfing pattern which is considered to be most strong of all in the right place. Who’d want to abandon their baby? I don’t think many people does it. 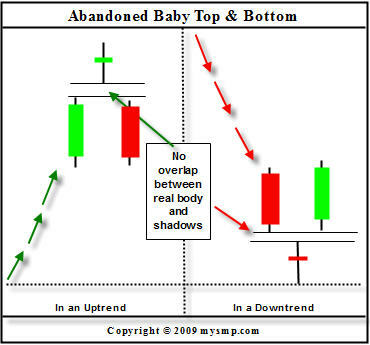 Similar situation applies to markets when it comes to Abandoned Baby reversal candlestick pattern. It’s appearance is pretty rare on trading charts but once it appears in a correct place [zone] it’s considered to be quite a reliable indicator of the trend reversal.